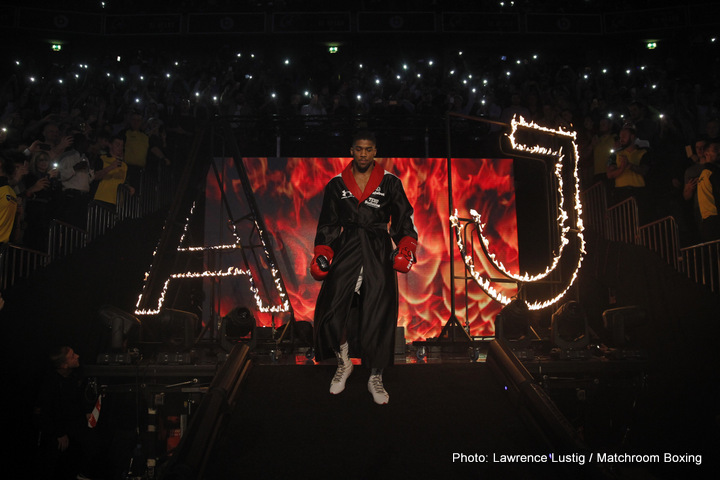 The hype with which Joshua is being sold not only as an elite heavyweight, despite his record, but as a sporting icon and national role model in the UK, reaches its nadir with the new ad released by Under Armour. The US sportswear outfit bought over the rights to Ali’s name and image in the wake of his death, and in the ad we see footage of a young Ali juxtaposed with footage of Joshua in action. The inference being made both are cut from the same cloth, that they belong in the same category, is an insult not only to Ali’s legacy but even more grievously to the truth. Ali, by way of a reminder, faced and defeated the likes of Sonny Liston, Joe Frazier, Ken Norton, George Foreman, and the US government in his career. Thus far Joshua has faced Dillian Whyte, Charles Martin, and Eric Molina. Thus not only does Joshua not belong in the same category as Muhammad Ali, he isn’t even walking on the same planet. Hype and heavyweight boxing have always occupied two sides of the same coin. The most famous example of a hyped up heavyweight involved the Italian giant Primo Carnera. During the ill-starred 1930s boxing decade, when ringside at championship fights across America you would see more mafia hoodlums than could fit in a black mariah, Carnera was propelled as a great white hope by dint not of his ability in the ring but on the back of one of the most remarkable PR and promotional jobs ever seen. Initially managed and trained by Leon See, the Frenchman who discovered him plying his trade as a circus strongman and wrestling act in France, and who was described by the US sportswriter Paul Gallico as “one of the most intelligence, smart and wily men that ever turned a fighter loose from his corner,” Carnera inevitably fell into the clutches of the mob. Thereafter one after the other his opponents took a dive, allowing the 6’7″ giant to actually believe he was as great as they said he was, a master of defensive fighting who carried TNT in his fists. Not for a second can Britain’s Anthony Joshua be compared to Primo Carnera. The former Olympic gold medalist possesses genuine boxing ability, power, and has real potential. The point is that at this stage of his career he is yet to achieve the greatness in the ring to match the profile he currently enjoys outside it. Indeed, the disjunction between both is an achievement that belongs to a team of whom the most public face is Matchroom’s Eddie Hearn, a man who looks like he collects Rolex watches like your average 10 year old collects toy soldiers. Hearn is only the latest in a long line of boxing impressarios whose stock in trade is the identifying, packaging and selling of fighters to a gullible general public. As with every promoter who has gone before, his dream, his is to find that rare diamond in the rough in the form of a fighter who is able to cross over into mainstream stardom, it’s the equivalent of winning the lottery. Such a fighter Hearn has clearly found in Anthony Joshua. But as with Primo Carnera, and as with Frank Bruno when he faced Mike Tyson, hype eventually crashes against the rocks of reality. If Joshua loses to an ageing Wladimir Klitschko at Wembley the ensuing damage limitation will centre on his lack of experience at the elite level compare to Klitschko, and how he deserves huge credit for taking this challenge at such an early stage in his career. However if he emerges victorious he will be regaled as the toast not only of heavyweight boxing but British sport as a whole, with brands flocking to offer him even more lucrative sponsorship deals than those he already has and Eddie Hearn smiling all the way to his local Bentley dealership. The very prospect is excruciating.